December 21 -27, 2017 Ms. PerryÂs Free Press Page 5 FOR THE WEEK OF DECEMBER 19 25, 2017Â’12-0 NC A&T BEST IN THE LANDAGGIES CELEBRATE: NC A&T LB Jeremy Taylor basks in 21-14 Celebration Bowl win over Grambling. FINAL BCSP TOP TEN; VIRGINIA UNION NAMES NEW FOOTBALL COACH; MORGAN STATE OUSTS FARRIER NC A&T Sports PhotoBCSP Notes Virginia Union names Dr. Alvin Parker as its new head football coach Virginia Union introduced Alvin Parker PhD, as the 27th head coach in the history of the school's football program at a press conference on Monday at the L. Douglas Wilder Library on the VUU campus. Parker returns to VUU after serving the past two seasons as assistant head coach and offensive coordinator at Saint Augustine's n Raleigh, N.C. Parker has strong ties to VUU having served as offensive coordinator and running backs coach for was part of a program that played in the 2000, 2001 and 2003 CIAA title games.While Parker was on the staff, the Panthers the 2001 Pioneer Bowl later as an assistant coach under Willard Bailey ," said Virginia Union Joe Taylor. Coordinator at Elizabeth City State University ." During his collegiate playing days at VUU, Dr. Parker earned offensive MVP honors in 1996 and 1998. He holds the school record for single season TDs and the Gold Bowl record for the longest TD, a 79-yard reception. During his years as an offensive coordinator, Dr. Parker helped guide Farrier out at Morgan State ics Edward Scott announced Tuesday that head football coach Fred T. Farrier has been released from his contract, effective immediately. Ernest Jones will serve as the interim head coach for the 2018 season. Jones had also served as the Bears' defensive coordinator. During his term as interim coach, Farrier guided the Bears to a 3-8 Mid-Eastern Athletic Conference as a member of former Head Coach Lee Hull's coaching staff and was promoted to the full-time position in December 2016. Parker DIV CONF ALLNORTH DIVISION W L W L W L Virginia Union 0 0 2 0 7 6 Virginia State 0 0 1 1 8 1 Lincoln 0 0 1 2 6 6 Eliz. City State 0 0 0 2 3 4 Bowie State 0 0 0 2 5 8 Chowan 0 0 0 3 4 7 SOUTH DIVISION St. AugustineÂs 0 0 3 0 5 8 Shaw 0 0 2 0 7 4 Winston-Salem State 0 0 2 1 4 8 J. C. Smith 0 0 1 1 8 3 Fayetteville State 0 0 1 1 4 7 Livingstone 0 0 1 1 2 4 CIAA PLAYERS OF THE WEEK PLAYER DeAngelo Stephens-Bell Sr., G, SHAW 20 points in win over Chowan, 24 in win over ECSU. ROOKIE Zaccheus Hobbs Fr., F, ECSU 17 points vs. Shaw, 6 pts. vs. St. Aug's. CIAACENTRAL INTERCOLLEGIATE ATHLETIC ASSOCIATIONMID EASTERNATHLETIC CONFERENCEMEAC CONF ALL W L W LNorth Carolina A&T 0 0 6 5 Bethune-Cookman 0 0 5 7 Morgan State 0 0 4 6 North Carolina Central 0 0 5 8 Hampton 0 0 4 8 SC State 0 0 4 9 Md. E. Shore 0 0 3 9 Savannah State 0 0 3 10 Delaware State 0 0 2 10 Howard 0 0 2 11 Norfolk State 0 0 1 11 Florida A&M 0 0 1 13 Coppin State 0 0 0 11 BCSP MEAC PLAYERS OF THE WEEK PLAYER R. J. COLE, Fr., G, HOWARD Tallied team-high 27 points in 62-60 loss to Jacksonville State. Shot SIACSOUTHERN INTERCOLLEGIATEATHLETIC CONFERENCE CONF ALLEAST DIVISION W L W L Morehouse 5 0 10 0 Clark Atlanta 5 0 11 1 Fort Valley State 4 1 7 6 Benedict 3 2 10 3 Paine 1 3 2 9 Albany State 0 4 0 12WEST DIVISIONLane 3 2 4 5 Central State 3 3 4 7 Kentucky State 2 4 3 10 Tuskegee 1 3 1 9 Miles 0 2 1 8 Spring Hill 0 3 2 9 LeMoyne-Owen 0 5 3 7 SIAC PLAYERS OF THE WEEK PLAYER Tyrius Walker 6-1, Sr., G, M'HOUSE Had 31 points in win Monday over Kentucky State, his second 30-point game of the season.SWACSOUTHWESTERNATHLETIC CONFERENCE DIV ALL W L W L Grambling State 0 0 4 7 Alcorn State 0 0 4 8 Southern 0 0 3 8 Jackson State 0 0 3 8 Prairie View A&M 0 0 2 9 Alabama State 0 0 0 10 Alabama A&M 0 0 0 11 Miss. Valley State 0 0 0 11 Texas Southern 0 0 0 12 Ark. Pine Bluff 0 0 0 12 BCSP SWAC PLAYER OF THE WEEKPLAYER & NEWCOMERDevante Jackson, 6-9, So., F, GRAMBLING STATE Came off the bench to score 16 points and grab 11 rebounds in win over SE Louisiana. M E N S 2 0 1 7 1 8 B L A C K C O L L E G E B A S K E T B A L L (Results, Standings and Weekly Honors) W L W. Va. State 6 5 Tennessee State 5 5 Lincoln (Mo.) 5 7 UDC 1 8 Cheyney 1 10INDEPENDENT PLAYERS OF THE WEEKPLAYER Christian Mekowulu, 6-9, R-Jr. F, TENNESSEE STATE Had 15 points and 11 rebounds in close 47-46 loss to Texas. Had only 3 points but led Tigers with 9 boards vs. NC A&T. Averaged 9.0 points and 10.0 rebounds in two games. NEWCOMER NAINDEPENDENTS Lamar Raynard scored on a 1-yard sneak with just :38 seconds left to allow Mid Eastern Athletic Conference champion North Carolina A&T to pull out a thrilling Southwestern Athletic Conference champion Grambling State and complete a perfect 12-0 season at the CelRod Broadway and the season. You end up 12-0? I donÂt know that youÂll ever see it again, simply because of the money games you have to play every year. ThatÂs why this team is so special." running back Marquell Cartwright and sophomore wide receiver Elijah Bell made the big plays, as they did all day, to get their team in position for the game-winner. But it could have been different. over the middle who was hit and apparently stripped by a Grambling Cameron Richardson recovering and in late and ruled the pass incomplete, much to the dismay of the GramKhris Gardin for 19 yards to move the ball into Grambling territory. who fought through three would-be tacklers for another 19-yard gain. his 10th catch of the day, to the Grambling 3. Cartwright carried to Darriel Mack for the game winner. keeping them just ahead on the scoreboard. plays, and they just made a couple more than we did," said Grambling head coach Broderick Fobbs who brought his team back to the bowl game for the second straight year. Cartwright, who caught just two passes all season, caught three in carries and scored on a 29-yard gallop midway thru the third period scores earned him the gameÂs offensive MVP award. nior running back Tarik Cohen now with the NFLÂs Chicago Bears, on that tradition. "We just wanted to let everybody know that just because TarikÂs gone, weÂre still a championship team," said Cartwright. "WeÂre a running back school. We wanted to let that be known." those passing yards to his two fellow underclassmen. tight end Jordan Jones ter. Dynamic running back Martez Carter the MVP of last yearÂs 10-9 win over N. C. Central in Celebration Bowl II, was battling sore ÂI thought they really got after us up front,ÂŽ said Fobbs. ÂThey made us one-dimensional. We couldnÂt really have a balanced attack and it forced us into 2nd-and-long and 3rd-and-long situations where time.ÂŽ Kiaundre RichardsonÂs Deion Jones and Jeremy Taylor Grambling linebacker DeArius Christmas led Grambling The teams were tied 7-7 at the half after Cartwright's and Carter's TD receptions. Grambling appeared poised to take the lead when it opened the line. But on second down, freshman cornerback Franklin ÂMacÂŽ McCain four solo tackles.CELEBRATION BOWL RECAPNorth Carolina A&T 21, Grambling State 141. NORTH CAROLINA A&T (12-0) Head coach Rod Broadway and the Aggies won the MEAC (80) and completed a perfect season with 21-14 win over Grambling State in Celebration Bowl III, the claim 2017 BCSP national championship. They took years to win the outright MEAC title. Also had wins over three non-conference opponents, one from the FBS (Charlotte, 35-31). Aggies were led on offense by MEAC Offensive Player of the Year, junior QB Lamar Raynard, junior 1,000-yard rusher Marquell Cartwright and sophomore WR Elijah Bell. 2. GRAMBLING STATE (11-2) Head coach Broderick Fobbs and the Tigers won the SWAC West (8-0) and defeated East Division champ Alcorn State for second time in the season (40-32) in the SWAC Championship game before coming up just short vs. NC A&T in the Celebration Bowl. Only other loss was 43-14 at Tulane in the second game of the season. Won 10 straight after. Senior QB Devante Kincade was named SWAC's top offensive player with LB De'Arius Christmas the league's top defender. 3. VIRGINIA STATE (10-1) Head coach Reggie Barlow and the Trojans won the CIAA North (7-0) and defeated South champion Fayetteville State 42-19 in the CIAA title round of the NCAA Div. II playoffs to West Georgia, 35-9. Senior RB Trenton Cannon was the CIAA offensive player of the year and led all black colleges with over 1,600 rushing yards. Sophomore QB Cordelral Cook ran for 18 TDs and threw for 11. 4. BOWIE STATE (9-2) 2 0 1 7 B C S P F I N A L F O O T B A L L T O P T E N Delta State, 45-35. Led by black college passing leader Amir Hall's 3,519 yards, 41 TDs (with only 4 ints.). RB Robert Chesson ran for 1,350 yards and 21 TDs. 5. BETHUNE-COOKMAN (7-4) ard at 6-2 suffering close conference losses to NC A&T (24-20) and Howard (26-24). Got big conference win at NC Central (13-7) and win over SE Louisiana (28-23). Also had losses at Miami (41-13) and at Florida Atlantic (45-0).6. HOWARD Had close losses in MEAC to NC Central (13-7) and Hampton (20-17). Big win to open the season at UNLV opened eyes. Stayed open as freshman QB Caylin Newton put on impressive showing, winning MEAC rookie of the year.7. ALCORN STATE (7-5) Won SWAC East Division title (5-2) for fourth straight year under second-year head coach Fred McNair. Finished the season with losses at 3-8 Jackson State and in SWAC title game to Grambling (40-32). Lost earlier to Grambling 41-14. Senior RB DeLance Turner led the league in rushing (1,355 yards, 10 TDs). Also had close losses to FIU (17-10) and McNeese State (34-27). 8. SOUTHERN (7-3) Lost to Grambling State 30-21 in season-ending Bayou Classic QB Austin Howard led the SWAC in passing (225 ypg., 18 TDs, 7 ints.). Also lost to Southern Miss and Texas San Antonio.9. NORTH CAROLINA CENTRAL (7-4) Finished tied for fourth in MEAC with Hampton at 5-3, losing at Norfolk State (28-21), on Hail Mary at home to Bethune-Cookman 10. TUSKEGEE (9-2) West Division champ defeated E. Div. champ Fort Valley State 13-6 in SIAC title game. Only lost early-season non-conference game vs. Albany State (20-7) and was humbled by Findlay, 61-0. Beat both Jackson State and Alabama State out of the SWAC.BROADWAY: Leads NC A&T Aggies to perferct 12-0 seaLUT WILLIAMS BCSP Editor North Carolina A&T left no doubt as to who was the No. 1 team in 2017 black college Grambling State Celebration Bowl ish with a perfect 12-0 record this season. Mid Eastern Athletic Conference and ranked 7th nationally in 2 Tigers, champs of the Southwestern Athletic Conference and ranked 11th in the Coaches Poll, Head coach Rod Broadway at 8-0 and handling all four non-conference opBL A C K CO LL E G E SP O RT S PA G E Tuskegee team under head coach Rick Comegy that could get by rival and nemesis North Carolina Central straight season-ending losses that not only denied head coach Jerry Mack 10-0 and proceeded to get the proverbial monkey Lamar Raynard player of the year award and -cords ( his chief target, sophomore wideout Elijah Bell ( back Marquell Cartwright ran for over 1,000 Brandon Parker again Top Ten. Head coach Broderick Fobbs and senior Devaante Kincade led Grambling duplicate last year's win in the Celebration Bowl that earned the Tigers the 2016 HBCU national championship. The G-Men handled everyone on er and linebacker DeArius Christmas took home the defensive award. Dynamic senior running back Trenton Cannon Cordelral Cook propelled Virginia State to a perfect 10-0 regular season including winning the North Division champ Fayetteville State But second-year head man Reggie Barlow's tend that success into the Div. II playoffs as they Cannon led all black college rushers with the Bulldogs of Bowie State Damon Wilson Amir Hall the only black college passer to top 3,000 yards this season, and the legs of RB Robert Chesson Bethune-Cookman is one of the few teams spot. Howard season, Mike London and Caylin Newton who were the talk of HBCU football after its openinggame victory at UNLV and remained that way The Bison hold down the No. 6 spot. lcorn State Grambling. losing twice to the G-Men. Southern tim falling to the G-Men for the third straight year in their season-ending Bayou Classic 8th. ed for North Carolina Central coach Jerry Mack who announced after the season that he was departing for the offensive it until a late-season, last-second loss to B-CU on a Hail Mary pass. SIAC champion Tuskegee pion Fort Valley State 61-0 regular season loss likely prevented Willie Slater's troops from reaching the Div. II playoffs for the fourth straight season. NC A&T Sports Photo AGGIE MVPsNC A&T junior running back Marquell Cartwright (l.) ran for 110 yards and one TD and had an 11-yard reception for another score to earn Offensive MVP of the Celebration Bowl. Freshman defensive back Franklin McCain (r.) had four solo tackles and a key second-half interception to win the Defensive MVP award. Page 8 Ms. PerryÂs Free Press December 21 27, 2017 by Dr. Arin Carter After years and years of making bogus New YearÂs resolutions and then never following through we have all simply conditioned ourselves to fail. So really anything at this point is an unrealistic expectation we already know weÂre not going to do it. Rather than reinforcing this old system of perpetual failure, forget the past, and try something new! The focus for this New Year is faith (and a plan, but IÂll get to that later). You are going to have to muster the belief (even if everything in your past suggests differently) that you actually are capable of making a change. YouÂll have to trash your old ideas, all of them, and start from scratch. HereÂs what youÂll need to do: 1. Get yourself a new and improved positive attitude for Christmas, and imagine, fantasize, even pretend, that you can do it! My guess is that disappointment has dismembered your faith, and I can certainly relate to that. But things can be different, it happens all the time, things go along the same old way for years and years and then something shifts Â… this shift is often due to a scare (your doctor tells you that if you donÂt stop this, or start that, youÂre headed for serious trouble) or an immediate and overwhelming desire (you want to look good for a wedding or reunion) or, believe it or not, it can happen because you decide (from a place deep down inside) that you can do it. No drama, no promises, no fearful consequences if you donÂt. The realization that you look, feel, or are living your life in a way that feels sub-par, unacceptable, or not at all what you want, has finally hit you like a ton of bricks and you very quietly decide that enough is enough. 2. DonÂt wait for insurance, or some sign from above that you Âtruly believe;ÂŽ start now, and if youÂre not convinced that any major shift has occurred, pretend, plain and simple, fake it, until you own the secure belief that you are capable, and able to stick with it and do what you set out to do. You may even go as far (and this would be great) as taking on a childlike wonder in knowing that anything is possible! 3. Stop trying to mentally muscle this thing, and stop trying to figure it out, thatÂs what you have been doing all these years. First you work it out, then you put restrictions and threats in place, then you try the reward system but alas Â… our minds actually, I believe, are responsible for the sabotage, and itÂs happening at a level (unconscious) that most of us have little or no understanding of. Belief, faith, and trust come from some special, unidentifiable and powerful place inside you Â… itÂs there it just is. You canÂt figure it out, so you canÂt screw it up either thatÂs the beauty. Even better, itÂs free. So you really have nothing to lose just try on some faith for good measure, for whatever, to humor me. Even the inference of faith is helpful. And, if you must, go ahead and give it a trial period, like 30 days, and if you donÂt feel better, you can forget the whole thing. 4. Have a ceremony, write down every reason you think youÂll fail and then burn it! I am not kidding you Â… this ritualistic act of relinquishing forever your thoughts and ways of old creates a giant opening for the new. Somehow, we (as individuals and a society) have come to a place in our lives where we no longer subscribe to, utilize, believe in, or have time for, ceremony, but this leaves us to live life from a purely mental, and physical place Â… void of belief in anything more than what we can see and feel. If you think this little act of ritual is Âout of characterÂfor you Â… do it for sure! The fact is, what you are about to do, and to transform into, is out of character for you, so get into the new you, do something that you wouldnÂt normally do Â… something that shows you are letting go of the old, and allowing for the new, on every level. 5. Repeat something positive to yourself over and over Â… like a mantra one that reinforces your willingness, like: a. I am ready to change my mind and my behavior. b. I can do this, and I know it Â… donÂt know how, I just do. c. My desire to change is enforced by my new actions. d. Even a little means a lot. This too is exercise. Mental exercises change your mind the way physical exercises change your body. But here we run into the dilemma of: if I havenÂt been able to commit to exercising regularly enough to lose 10 lbs., how can I expect that I will do my mental exercises and change my mind? The answer is Â… you act as if you believe. Do it anyway, go forward and trust that with this new attitude, these exercises, and your inner decision to change, everything will be fine. Set yourself up for success by only committing to yourself to do what you know you will do. DonÂt overwhelm yourself with grand expectations, and visions of grandeur, keep it small and simple. Instead of planning to walk 30 minutes every day, commit to 10 minutes every other day and then anything over that is gravy! Commit to giving up sugar once a week instead of every day and go from there. 7. Every week, make a simple, really realistic plan of action, one that is so doable, you cannot fail. Take baby steps with this and get very specific with your plan. Write down each little step and make sure that when you read it over you are not questioning its viability at all. For example: Monday morning I must be at work by 8 a.m. so I will pack my tennies, walk for 10 minutes at my noon lunch break to meet my friend Sarah at the park. If Sarah bails on me, I will go anyway, take a magazine or my ipod and relax. IÂll eat my lunch, and then walk back for 10 minutes. (ThatÂs 20 minutes of walking and anything you do over that is gravy). 8. Do your plan with someone else; often, people work better as a team. I feel like the group effort (even just two of us) is more fun, and the collaboration is great, like when I say I donÂt have time to do something, and Gail says, what about this? We write it down, shake hands and commit to doing it. We get to check in with each other, complain to one another, and then be revived by pep talking ourselves back to a good place. And I know I feel a sense of ÂI am counting on you,ÂŽ from Gail, which makes it all feel a little more important. 9. Visualize yourself doing whatever you have set out to do. See the action of getting to the gym tomorrow in your mind. Or see yourself choosing the foods that you want to eat, refusing those that you are letting go of. Go to bed visualizing in detail your day, then let it go Â… sweet dreams. DonÂt stress or obsess over it. You see it, then you do it, then you own the reward of following through. 10. DonÂt stop and start over; we all screw up. You must stay on the road Â… pick it up where you left off, and keep moving forward; one unplanned muffin indulgence wonÂt kill you Â… keep moving forward on your plan Continued from page 7 Other celebs such as Uma Thurman, Ashley Judd, Eminem and Marie Osmond who have gone public about their private bouts with depression can understand his struggles. Shattering the illusion of the glamorous life he states, "Sometimes it's like people think that you don't go through what they go through and that's such a lie. We have fear, worry, anxiety and depression just like everyone else." When a person becomes depressed, doubt, its first cousin usually stops by for visit. All of this became apparent as Kirk and I delved deeper into conversation about the battles that were raging when he produced "The Fight of My Life." Mona Austin : You describe various issues people were facing as the basis for the CD title, "The Fight of Your Life. Where you going through something personally that inspired the title? Kirk Franklin: I was just really struggling. I got depressed fighting with some stuff in my head. The songs didn't come easy, but when it did break it was a lot to be said." MA : How do you prepare the material for an album like this? KF: There's no one thing because it doesn't just come one way. Sometimes I'll just ask the Lord to give me what to say. Or I'll be in my car, you know. Sometimes it's a verse, melody, lyrics. MA : What was the toughest song to write? KF : "Help Me Believe." I wanted to make sure how I felt was being inter p reted exactl y how I felt it. powerful songs and touched so many people's lives-you're Kirk Franklin? KF: [He snickers.] God not answering prayers when I wanted them to be answered. You know, what is He doing in me? This is driving me crazy like God ain't speaking. It can be scary. I can struggle with depression like everyone else. MA : Is this the fight of your life? KF: I believe it's a fight just like everyone else's. I might be affected by what I do for a living, but it's still something everyone goes through. MA : Summarize what you hope this album will mean to your fans. KF: I hope it will connect to them where they are and strengthen their faith. That concludes our interview. We say our good-byes, but Kirk's phone doesn't hang up. He's a few minutes late for his next appointment. "Kirk!" I cry out to make sure he knows his line is wide open. In the mix of background noise I hear the enthusiasm about his arrival, the lilt in his voice and know he's ready for the next engagement. I hang up hoping they don't miss the tear. "The Fight of My Life" is in stores now. William L. Cody, M.D. B. Vereen Chithriki, M.D. St. VincentÂs Division IV 1820 Barrs Street, Suite 521 C o m p l e t e O b s t e t r i c a l & G y n e c o l o g i c a l C a r e Comprehensive Pregnancy Care Board Certified Laser Surgery Family Planning Vaginal Surgery Osteoporosis Menopausal Disorder Laparoscopy Menstrual Disorder N O R T H F L O R I D A O B S T E T R I C A L & G Y N E C O L O G I C A LA S S O C I A T E S P A A s k D y r i n d a h a i r a n d s k i n t i p s f o r t o d a y s w o m a n o f c o l o r Alright ladies itÂs that time of year again and chances are you have at least one holiday party to attend. IÂm sure by now you have your dress, and your shoes, so what are you going to do about your hair? Well thatÂs where I come in. I have a few easy and inexpensive suggestions to help you get glam for the new year. Let me start by saying all of the ideas IÂm giving you are inexpensive and for the most part you should be able to do them at home. In my opinion I donÂt think you can go wrong with a pony tail. If you really want to switch it up for a special occasion, hereÂs an idea. If you have short to medium hair then why not pull it back in a ponytail or a small bun. Make sure your hair is pulled back tightly. You may need to apply some gel to make sure youÂre able to get the look you want. Once your hair is pulled back why not add a much longer ponytail. Depending on the type and quality of hair you purchase, you could easily pick up a ponytail for around 20 dollars. Here is the trick if you want something simple you can find ponytails with a tuck comb which will allow you to easily attach it to your hair. For extra security, just in case you plan on swinging and shaking it on the dance floor you, can always use bobby pins to make sure itÂs securely in place. Now if youÂre going for a more conservative look, than I suggest attaching a bun. Again, these are pretty easy to do. Now depending on the length of your hair there are places that sell tools to help you make a bun. Hair extensions already formed in the shaped like a bun are pretty expensive also. Either way you choose make sure that like before just pull your hair back, so you can easily attach it. Once again keep those bobby pins handy because you will need them to keep your bun in place. Finally my last suggestion of course is a wig. For those of you who donÂt wear wigs, get that idea out of your mind that wigs are only for older woman and they all look fake; because thatÂs not necessarily the case. There are a ton of wigs on the market, many of which you can blend with your own hair. Well those are my ideas for a quick glam do this holiday season that you can do at home, now if you really want to get fancy, of course you can call me and weÂll come up with something together. Thanks for reading. Happy New Year. Happy Holidays from DS Spa & Salon. If you would like Dyrinda to answeryourquestions about hair, please send yourquestions to JFreePress@aol.com. DS Spa and Salon is locatedat 9810 Baymeadows Rd Suite #2. She can be reached at 645-9044. Holiday Hair Kirk Franklin in his biggest battle Make Your New YearÂs Resolution Work As you jubilantly celebrate, rememberthe affirmations and responsibilities you owe to yourself. 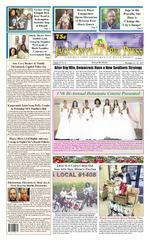 The Jacksonville Free Press would love to share your event with our readers. GUIDELINES 1. All unsolicited photos require a $10 photo charge for each picture. Photos can be paid by check, money order or credit card, 2. Pictures must be brought into our office to be examined for quality or emailed in a digital format of .jpg or .bmp. 3.Everyone in the picture must be named. 4. All photos MUST be received within 5 days of the event. OEXCEPTIOS. 5. Event photos must be acconpanied by a story/event synopsis including the 5WÂs of media: who, what, when, where and why. in addition to a phone number for more information.Call 634-1993 for more information! Only those who care for others know what itÂs really like to care for others. ThatÂs why AARP created a community with experts and other caregivers to help us better care for ourselves and for the ones we love.NOW THAT MOM LIVES WITH US, MORE THAN EVER. aarp.org/caregiving or call 1-877-333-5885 Urinary Tract Infections Effect the Elderly Differently By Glenn Ellis When bacteria enter the urethra and your immune system doesnÂt fight them off, they may spread to the bladder and kidneys. The result is a urinary tract infection (UTI). Urinary tract infections (UTIs) are responsible for around 8.1 million doctor visits per year. Most urine infections are caused by germs (bacteria) traveling from the skin up the tubes of the urinary system. In men, this distance is further, and the end of the urine tube is farther away from the germs of the guts. So men tend to get urinary tract infections (UTIs) less commonly than women. Women are four times more likely to get UTIs than men because their urethras are shorter than menÂs urethras. Your UTI risk increases with age. More than one-third of all infections in people in nursing homes are UTIs. Over 10 percent of women over age 65 report having a UTI within the past year. That number increases to almost 30 percent in women over 85. Men also tend to experience more UTIs as they age. As you get older, UTIs become more common. This is because you are more likely to have conditions which make it easier for germs to get access to your urinary system. In men, enlarged prostate glands prevent proper emptying of the bladder, which encourages UTIs. In women, after menopause the tissue around the lower end of the urinary tube (urethra) gets thinner and drier. This means the germ-repelling function works less well. Having said that, many urine infections happen to people without these problems, just as they do in younger people. Interestingly enough, the elderly with a UTI are often misdiagnosed with senior dementia or AlzheimerÂs disease, because a UTI can mimic symptoms of such conditions. Also, according to Nursing magazine between 30 percent and 40 percent of elderly patients with serious infection donÂt exhibit the hallmark sign of fever due to the inability of the immune system to mount a response to infection due to the effects of aging. As the bacteria in the urine spread to the bloodstream and cross the blood-brain barrier, confusion and other cognitive difficulties can be the result. Sudden onset of these symptoms should lead one to investigate possible UTI. An elderly person who is experiencing signs of mental difficulties should also be closely monitored for other signs of a UTI. The classic symptoms of a urinary tract infection (UTI) are burning pain and frequent urination. UTIs may not cause these classic symptoms in older adults. Instead, older adults, especially those with dementia, may experience behavioral symptoms such as confusion. Antibiotics cure most UTIs. Without treatment, a UTI can spread to the kidneys and the bloodstream. This may lead to a lifethreatening blood infection. Severe infections may require hospitalization for intravenous antibiotics. These can take weeks to resolve. The best way to treat UTIs in the elderly, or anyone for that matter, is to try to prevent their occurrence. UTIs can be prevented or their recurrence minimized by: Not using douches or other feminine hygiene products; not drinking fluids that tend to irritate the bladder, such as alcohol and caffeine; drinking cranberry juice or taking cranberry supplement tablets, but only if you or your family does not have a history of kidney stones and of course drinking lots of water. Keeping the genital area clean; if wearing adult diapers see that they are changed regularly; wear cloth undergarments; and always wiping from front to back (for women). A UTI can cause confusion and other symptoms of dementia in older adults. A bladder infection places stress on the body. That stress can result in confusion and abrupt changes in behavior in older adults with an elderly urinary tract infection. And for people suffering from ParkinsonÂs disease, AlzheimerÂs disease, or other dementia; any kind of stress, physical or emotional, will often make dementia temporarily worse. Urinary tract infections can exacerbate dementia symptoms, but a UTI does not necessarily signal dementia or AlzheimerÂs. UTIs can cause distressing behavior changes for a person with AlzheimerÂs. These changes, referred to as delirium, can develop in as little as one to two days. Symptoms of delirium can range from agitation and restlessness to hallucinations or delusions. Further, UTIs can speed up the progression of dementia, making it Entries for the 2018 Grateful Book Prize are Being AcceptedThe Grateful American Book Prize has begun accepting submissions for 2018. The Prize is awarded annually to authors for outstanding works of historical non-fiction and historically based fiction, which are intended to inspire 11 to 15 year olds. Books published between July 1, 2017 and July 31, 2018 are eligible. The Prize comes with a $13,000 cash award and two "Honorable Mention" authors receive the medallion, and $500 each. Submission forms and further information about the Prize can be found at www.gratefulamericanbookprize.com. White House to Decide if ÂegroÂ Will Remain on Federal Forms Despite being racist, inflammatory and insulting, the word ÂNegroÂŽ remains on federal forms. But NPR reports that the White House may soon decide to keep it on documents or dismiss it. Back in the early 1900s, ÂnegroÂŽ was considered a modern term that could be used to classify people of African descent for the countryÂs census. But as time progressed, the word has been deemed nothing short of offensive. So why is our United States government struggling with banning the term once and for all? Well in 2013, the U.S. Census Bureau announced that it would drop use of the word from its documents and other surveys. In 2014, the Army made a similar decision regarding use of the term on its official document that outlined its equal opportunity policy. In 2016, then-president Barack Obama replaced the word ÂNegroÂŽ with ÂAfrican American.ÂŽ It was the law. ÂNegroÂŽ is still up for fair use on federal forms today. In fact, the term Âcan be used if desired.ÂŽ Currently, there is a proposal that serves as a means of endorsing the termÂs removal. In it, a recently formed group of federal experts cited concerns of survey participants finding the term ÂoutdatedÂŽ or Âoffensive.ÂŽ The NAACP, The Urban League and other civil rights groups, have also advocated for the termÂs dismissal on federal forms. ÂThere is a very clear consensus that the obsolete term ÂNegroÂ should be eliminated,ÂŽ said Marc Morial, president and CEO of the National Urban League, in a written statement sent to NPR in response to the White HouseÂs delayed announcement. ÂWe urge the administration to proceed immediately, keeping the fairness and accuracy of the census at the forefront of concern.ÂŽ Which federal forms include the word remain unclear, but several state governments, schools and hospitals still allow use of ÂNegroÂŽ on its forms. Currently, the Trump administration is considering a proposal that will remove the word from federal forms. The administration will also review the use of ÂFar East,ÂŽ which is currently meant to described those of Asian descent. The Marvin Gaye Experience is ComingWhat's Going On: The Marvin Gaye Experience takes the stage Sunday, March 11th at 7 p.m. at the Thrasher-Horne Center located at 283 College Drive, Orange Park, FL. The concert is a tribute to the legendary artist and includes music selections that span GayeÂs music-making career. For tickets and more info visit at www.THcenter.org. Simonds Johnson Reunion Meeting The Simonds-Johnson Park Community Reunion Committee invites the community to their annual Christmas Dinner and Dance, Friday, December 22nd, 6 11 p.m. at Morris Manor Auditorium, 9050 Norfolk Blvd. Come enjoy holiday music, food, dancing and fun. For tickets call Yvonne Brockington at (904) 6136251. Downtown Cigar Lounge Toy DriveThe Downtown Cigar Lounge, located at 11 North Ocean Street, will host their 3rd annual Holiday Toy Drive giveaway on Saturday, December 23rd at 7 p.m. The donation deadline is Thursday, December 21st. For more information call (904) 353-4411.St. Michael Charities Christmas Toy DriveSt. Michael Charities will host a Christmas Toy Drive, Saturday, December 24th at 11:30 a.m. at the office located at 3529 North Myrtle Avenue. To donate a toy or sponsor a child call (904) 240-1357.Cool RunningÂs Christmas BashItÂs the official ÂCool RunningÂs Christmas BashÂŽ taking place Monday, December 25th, 10 p.m. at Vibe Sports Bar located at 5800 Philips Hwy. For tickets and more info (904) 300-7887.Kwanzaa CelebrationCelebrate Kwanzaa with the African Village at the Ritz Theater located at 829 N. Davis St., Wednesday, December 27th at 11 a.m. The theme is ÂKujichaguliaÂŽ meaning self-determination, to define and name ourselves, as well as to create and speak for ourselves! For more info visit www.ritzjacksonville.com.FLAJax Christmas BallThe Fla Jax ClubÂs annual Christmas Ball is scheduled for Friday, December 29th at 8 p.m. at the Double Tree by Hilton, located at 1201 Riverplace Blvd. The club was founded in 1930 by a group of prominent, African American men whose motto is based on leadership, integrity, and fidelity. For tickets and more info contact James Andrews at (904) 868-9150.Holiday Block Party ConcertThe Holiday Block Party concert will be on stage, Friday, December 29th featuring Keyshia Cole, Carl Thomas, Doug E, Fresh, K-CI & JoJo, 95 South, Ying Yang Twinz, 69 Boyz and 112! Location is the Veterans Memorial Arena located at 300 A. Philip Randolph Blvd. For more info call (904) 469-4465.2018 Vision Board PartyThe Jacksonville Best Vision Board party hosted by Angela Mealer will take place, Saturday, December 30th at 11 a.m. Location is the Rhythm Factory located at 9501 Arlington Expressway. A vision board party is a fun and exciting way to create visual presentation of what you desire for your life in 2018 and beyond! For tickets and more info visit 904tix.com.Reggae on the BeachEnjoy Reggae on the Beach at historic American Beach Saturday, December 30th, 11 a.m. 6 -p.m. at Burney Park located at 95570 Burney Blvd, Fernandina Beach, FL. This event is free and open to the public. For more info contact Eve Jones at (904) 277-7960.Riverside Arts MarketThe Riverside Arts Market (RAM), 715 Riverside Ave., will have their end of the year open market day on Saturday, December 30th at 10 a.m. and will begin operating in the New Year Saturday, January 6th from 10 a.m. 3 p.m. RAM guests enjoy local arts, food and agricultural produce, artists and farmers. For more information visit riversideavondale.org.So LongÂ17 BrunchThe So LongÂ17 Brunch will take place Sunday, December 31st, 10 a.m. at The Candy Apple Caf located at 400 N. Hogan St. Come celebrate in delicious style! Enjoy brunch, music, candy and more! For more info visit www.thecandyapplecafe.com.Breezy Jazz Club YE CelebrationThe Breezy Jazz Club New Years Eve Bash hosted by jazz artists Doug Carn and Gwen Redding. Enjoy food, smooth jazz and more, Sunday, December 31st 9:30 p.m. 12:30 a.m. Breezy Jazz Club is located at 119 W. Adams St. To RSVP and more info call the club at (904) 666-7562.Casa Marina ew Years Eve CelebrationThe Casa Marina HotelÂs 12th Anniversary New Years Eve Celebration is scheduled for Sunday, December 31st, 7:30 p.m. Â… 2 a.m. Enjoy dinner, champagne toast and Balloon Drop! Casa Marina Hotel is located at 691 1st St N. For tickets and more info call www.CasaMarinaHotel.com. ew Years Eve Masquerade BallAttend Natasha OÂs New Years Eve Masquerade Ball scheduled for Sunday, December 31st at 9 p.m. at the Rhythm Factory, 9501 Arlington Expressway, #325. For tickets call (904) 887-2366.Kappa 5K RunThe Jacksonville Alumni Chapter of Kappa Alpha Psi Fraternity and the American Diabetes Association new year healthy start 5K Run is scheduled for 8 a.m. and the One Mile Fun Run at 9 a.m., Saturday, January 6th at the Jacksonville Landing. For more info visitwww.1stplacesports.com/healthy 5K.html.Who is She? Empowerment SummitThe Who is She? Empowerment Summit is scheduled for Saturday, January 6th at 1 p.m. at Elite Celebrations Banquet Hall located at 4747 San Juan Avenue. Come enjoy giveaways, refreshments, vendors, networking and more! For more info call (904) 719-6265.P.R.I.D.E. Book Club MeetingThe People Reading for Inspiration, Discussion and Enjoyment (P.R.I.D.E.) New YearÂs book club meeting will be Saturday, January 8th at 2:30 p.m. Book for discussion is: Â Where Good Ideas Come From The atural History for Innovation ,ÂŽ by Steven Johnson. Host is Reva Oliver and location is 3470 Hickory Landing Ct. For more info call (904) 910-7297.First ThursdayÂsThe next First Thursday meeting will be on January 11th at 4:30 p.m. with the 2nd Annual State of Black Jacksonville panel discussion. It will be held at the Urban League building located at 903 W. Union Street. For more info visit www.firstthursdayjacksonville.org.The Black Man Walking GalaBlack Men Walking and the Influence Crew presents, ÂThe Black Man Walking Gala,ÂŽ a Black Tie awards celebration for influential men in the African American Community, hosted by Gene Dot.com, Saturday, January 13th, 7 11 p.m. at the Schultz Center located at 4019 Boulevard Center Dr. For more info call 554-4663.Temptations Revue with Bo HendersonBringing the unforgettable songs of Motown back to the Ritz Theatre and Museum will be a Temptations Revue featuring the former lead singer of the Temptations and Grammy Award winner Barrington ÂBoÂŽ Henderson (1998-2003). The concert will be on Saturday, January 13, 8 p.m. at the Ritz Theatre, located at 829 N. Davis St. For tickets more info call 632-5555.Women at Werk Empowerment ConferenceOn Saturday, January 13th, from 9 a.m. to 4 p.m. itÂs the inaugural ÂWomen at WerkÂŽ Empowerment Conference, hosted by Action News Jax anchor Letisha Breda. Location is the Aloft Hotel located at 4812 Deer Lake Park W. For tickets, visit www.womenatwerk.com.Human Trafficking DialogueAttend the interfaith prayer for the end to human trafficking at International House of Prayer, located at 1515 Prudential Dr., Wednesday, January 17th from 67 p.m., and Thursday, January 18th is the gathering of the coalition; networking starts at 5:30, program starts 6:30 at FSCJ SouthÂs Wilson Center located at 11901 Beach Blvd. For tickets and more info visit call (904) 399-1199.Jacksonville Science FestivalThe Jacksonville Science Festival is scheduled for Wednesday, January 17th at 3 p.m. at the Museum of Science and History located at 1025 Museum Circle. For more info visit www.themosh.org.Black History Calendar UnveilingThe unveiling of the 2018 Jacksonville Black History Calendar is scheduled for Thursday, January 18th, 4 p.m., at the Main Library located at 303 N. Main St. For more info email: simmons_b@bellsouth.net.Decades Rewind TourThe Decades Rewind touring concert, dance party and theatrical performance show celebrating the hits of the 60's, 70's and 80's is scheduled for Thursday, January 18th at 7:30 p.m. at the Thrasher-Horne Center, St. Johns River State College, 283 College Drive, Orange Park, FL. For tickets and more info visit www.THcenter.org Marvel Universe LiveÂMarvel Universe Live, Age of HeroesÂŽ is a legendary superhero battle to defend the universe from evil! The live-action arena spectacular will hit town January 19 21st Show times are 11:30 a.m. and 7:30 p.m. at Veterans Memorial Arena, located at 300 A. Philip Randolph St. For tickets visit www.jaxevents.com.ÂFool For LoveÂ Play Live on StageÂFool For Love,ÂŽ the play that depicts reality and fantasy, as past and present collide in this explosive and timeless masterwork by Pulitzer Prize-winning playwright Sam Shepard will take to the stage January 19 February 11th at the Limelight Theatre, located at 11 Old Mission Ave St. Augustine, Florida. For show times and more info visit www.limelighttheatre.org.2nd Annual Taste of San MarcoAttend the 2nd Annual Taste of San Marco, Saturday, January 20th, 5 8 p.m. at the Bolles School located at 7400 San Jose Blvd. For more info call (904) 733-9292.Vaginal Health SummitA Vaginal Health Summit will take place Sunday January 21st 3 6 p.m. at the Salem Center located at 7235 Bonneval Rd. Come learn about taking care of yourself from a holistic approach. For tickets and more info call (904) 861-0440. Page 10 Ms. PerryÂs Free Press What to do from social, volunteer, political and sports activities to self enrichment and the civic scene AROUND TOWN AROUND TOWN December 21 27, 2017 Enclosed is my __ check __ money order for $38.50 (within city limits) __$43.00 (outside of Jacksonville) NAME ___________________________________________________________________ ADDRESS ________________________________________________________________ CITY____________________________________ STATE______ ZIP_________________ If this is a gift subscription it is provided by (so gift notification card can be sent) ______________________________________ Please send check or money order to: Jacksonville Free Press P.O. Box 43580, Jacksonville, FL32203 If you would like to pay by Visa or Mastercard, give us a call at (904) 634-1993 Enclosed is my __ check __ money order for $40.50 (within city limits) __$45.00 (outside of Jacksonville) SUBSCRIPTION RATES Do You Have an Event for Around Town ?The Jacksonville Free Press is pleased to print your public service announcements and coming events free of charge. news deadline is Monday at 6 p.m. by the week you would like your information to be printed. Information can be sent via email, fax, brought into our office or mailed in. Please be sure to include the 5WÂs who, what, when, where, why and you must include a contact number.Email JFreePress@aol.com Fax (904) 765-8611 Mail: ComingEventsJacksonville Free Press 1122 W.Edgewood Ave. Jacksonville, FL 32203 SUBSCRIBE TODAY FOR ONLY $40.50 MLK Parade Registration UnderwayDr. Martin L. King Jr. Memorial Foundation Inc., 50th Grand Parade planning is happening now! The celebration will take place Monday, January 15, 2018. If your church, mosque, synagogue, organization, group, sorority, fraternity, school group, performing arts school would like to participate call now! Deadline to register is Saturday, December 30th. To register and for more info contact Brother Andre X at (904) 768-2778.